The UK Lotto Service allows you to play the UK National Lottery and Euro Millions draws using different systems. By opening an account at the UK Lotto Service today you will get 2 weeks of lotto worth £18.80 for just 39p. 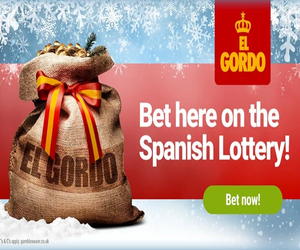 The UK Lotto Service allows you to play the UK National Lottery and Euro Millions draws using different systems that dramatically increase your odds of winning a cash prize or even the jackpot. With the systems they offer you will always have a winning number on each draw which increases your odds of winning fivefold. By playing at the UK Lotto Service you will never forget to buy a ticket, all tickets are automatically checked and any winnings are deposited straight into your bank account. Opening / Special Offer: By opening an account at the UK Lotto Service today you will get 2 weeks of lotto worth £18.80 for the unbelievably low price of 39p! This offer gives you a £1 lucky dip into the Wednesday lotto draw each week, a lucky star system syndicate ticket into the Friday Euromillions draw and a system 5 system syndicate ticket into the Saturday Lotto draw. (More information on the different syndicate systems they offer can be found below) If you do not decide to continue after the two week 39p trial then you can cancel at any time. By signing up today you will also be entered into a draw to get all your bills paid for the next 3 months valued at a massive £6000. The winner will be drawn on the 19th March 2015. System 5 Lotto – The System 5 guarantees that you will get 1 number correct as you only play 5 numbers out of 6. This syndicate is made up of 10 members and cost £4.40 / week. Statistic 9 Lotto – On the Statistic 9 you play a mathematical system where it picks 4 of the most drawn numbers from all National Lottery draws since 1994 and 5 random numbers. This cost £3.36 / week. System 4 Euromillions – With the System 4 you only play 4 out of the 5 numbers and the 5th is a guaranteed winner. There are 10 members in each syndicate costing £9.20 / week. Lucky Star Euromillions – In the Lucky Star syndicate you are guaranteed to match 1 lucky star in each draw. This is made up of 5 members and costs £4 / week. Statistic 9 Euromillions – Like on the system 9 lotto this is made up of the 4 most popular numbers since 2004 and 5 random numbers. This is made up of 25 members and costs £6.72 / week. Lucky Dip – This is just a standard lucky dip costing £1. (This doesn’t include the National Lottery Raffle) You can choose to participate in either draw and pay from £1 – £7 per week. Payment Options: You can make payment with any major debit or credit card. Winnings: Any winnings will automatically be added to your account. If you win £35 or less it will be added to your UK Lotto Service account. If it is more than £35 you can withdraw it directly to your bank account. You can change the payment limit at any time by logging into your account.